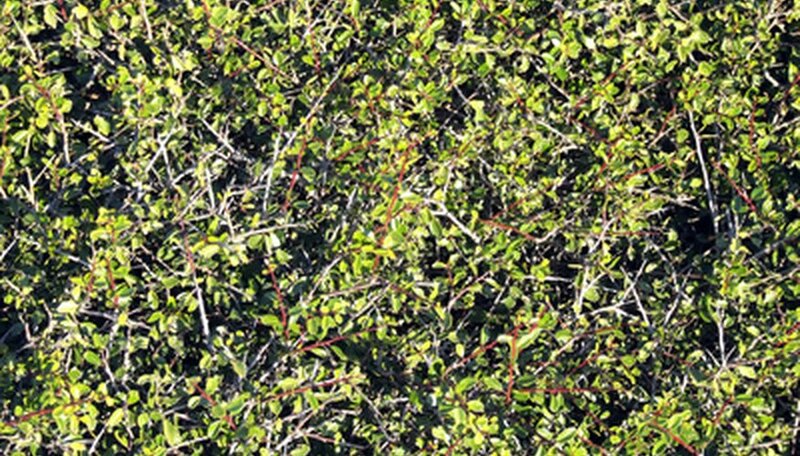 Black spot disease is a common affliction of shrubs. The fungi that causes black spot disease favors cool wet conditions and often crops up after excessively rainy seasons. Black spot disease should be treated as soon as you spot it. If allowed to remain on the plant, the spots will germinate spores that spread easily through touch or splashing rainwater. Infected plants are more susceptible to environmental stress and frost damage. Control the spread of the fungus. Remove all of the infected foliage on the shrub and any leaf litter from its base. Any otherwise damaged or dead leaves should also be removed but wait until the end of the growing season to avid removing too much foliage at any one time. Prune the interior of the shrub to improve air circulation and allow sunlight to penetrate the interior. Use pruning shears to remove branches at their base, leaving as little a stub as possible. Water the shrub at its base from now on to avoid wetting its foliage. Wet leaves are an ideal breeding ground for black spot fungus. Spray the plant with fungicide if black spot persists after all affected areas have been pruned. Common black spot fungicides include triforine (Funginex) and phaltan. Black spot fungicides must be applied preventatively. They do not kill existing fungi but will kill any germinating fungal spores that land on your shrub's foliage. Spray the fungicide at bud break, and follow that with a second application one to two weeks later. A third application is necessary only during excessively rainy periods. Do not remove more than 1/3 of a shrub's foliage at any one time. If black spot disease persists from year to year, make sure that the growing conditions for your shrub are ideal. You may have to switch to another species of shrub, or a more disease-resistant variety.